Break the Racist Isolation of Refugees and support our Resistance! Show solidarity with our resistance against state racist persecution! Since 1994, we have accomplished much in our active struggle through empowering grassroots resources of refugee self organization in the struggle for freedom, justice and human dignity in Germany. We believe the only way to fight against the state persecution of refugees in Europe, led by the German government, is to self-organise ourselves and expose the deplorable, miserable and inhuman treatment we are subjected to by individually and collectively speaking about our daily experiences here in Germany and resisting the oppression. The VOICE Refugee Forum has consistently remained a unique ressource in refugee efforts to strengthen the autonomous structure of the oppressed through sustainable community network of refugees and non-refugee volunteers and activists, who have been inspired by our irrepressible commitment to our daily work and struggle against institutionalized discrimination and societal racism at all levels. The VOICE Refugee Forum has led much of the support in the refugee communities through our consistent role as committed activists and at the same time, promoting grassroots empowerment with vast representation of diverse voices of self organized community structures, to advocate for the respect of our human rights and human dignity in Germany. Since the July 2010 Caravan Festival, we have intensified our online documentation of the inhumane isolation and ghettoization of refugee lives by the German government with daily and weekly reports of repression of refugees in countless Lagers throughout Germany. We continue our demands for justice, human dignity, freedom of speech and freedom of association. This documentation is based on regular contact of The VOICE activists with refugee communities in the Lagers. Intensive networking in conjunction with Caravan activists already exists in Mecklenburg-Vorpommern, Niedersachsen, Sachsen-Anhalt, Rheinland-Pfalz, Nordrhein-Westfalen, Bremen, Thuringen, Bayern, Hamburg and Baden Wurttemberg, as we are undertaking regular visits to the Lagers to empower the refugee communities through delegation tours and political exchange and solidarity. As we intend to publish the full pack of documentation later next year, we need your support and further contributions to strengthen the refugee community initiatives. We call for a nationwide support and solidarity for the refugee community networking initiative and activities. Pro-refugee and antiracists activists are also invited to contribute in solidarity with the struggles of The VOICE Refugee Forum. This documentation will serve as the background to the planned International Tribunal on Refugee situation in Germany by the Caravan for the Rights of Refugees and Migrants. Without exception, the German constitution states very clearly that human dignity is inviolable. But how is this interpreted by German politicians and authorities at both the state and federal levels with respect to innocent refugees? They impose the archaic and racist Residenzplicht coupled with all the institutionalized discrimination that is the hallmark of the Asylbeweberleistungsgezetz on us. They confine us to our local districts making us instant and perpetual criminals the moment we dare exercise our natural rights to freedom of movement. This shameful and horribly racist law is shamelessly defended by the authorities here in Germany in the name of “law and order”. The Residenzpflicht has become their weapon of first choice to stigmatize us as criminals who do not deserve to live in this country. Since the Caravan Congress of 2000, The VOICE with the Caravan network has led the campaign against this racist law and some of our members have been imprisoned as a result of their civil disobedience against the law. Yet, freedom of movement have remained a serious challenge. It remains a daunting challenge to our efforts to Break the Silence and Isolation despite the obvious state efforts to gloss over its inhumanity and cruelty, with cosmetic, superficial and deceptive changes. The substantive issue of our right to freedom of movement is not addressed. Let it be known that we are not and we cannot be deceived by such lip service and hypocrisy, irrespective of the surrogates through whom they want to "humanize" their inhumanity. 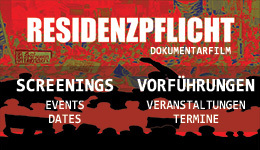 We call for the abolition of the Residenzpflicht and that is NON NEGOTIABLE. In a country where the constitution guarantees human dignity, the politicians confine us as refugees to crowded rooms with walls that are carpeted by fungus (Schimmel). They expose us and our little children to such health disasters in the hope that if they cannot forcefully or dubiously deport us, they can at least slowly destroy us, while it appears invisible, with long illness that may result from such exposure to health hazards. Alternatively, if we don't like it, we will eventually be forced out willingly or unwillingly. This is why they continue to surreptitiously execute the policy of confining us to crowded rooms in the Lager even where there are countless research showing that it is cheaper for refugees to live in individual apartments than such a dehumanizing Lager. Where they cannot in good conscience place their dogs or cats, they deliberately force us to live in. Can there be any explanation for this? Only these heartless politicians can rationalize and justify this inhumanity and persecution. But we challenge them to practice what they preach and show us that they still have a human heart. We are sick and tired of this blatant hypocrisy and the obviously irrefutable contradiction in their practices at our human cost. Yes, they are surprised to see refugees refusing to accept being brutally violated and dehumanized. They are surprised to see refugees protesting in various Lagers all around the country against the inhuman treatment that we suffer. They are surprised that instead of being "grateful" for being given a place where we are abused and violated, we are bold and daring to publicly speak about our horrible experiences in the Lagers and against the societal racism that we face. They may be surprised but they forgot that we did not become refugees here for keeping dumb against the violent and brutal dictatorships and the dubious systems that they sponsor in our countries. Most of us have been turned into refugees by our refusal to be quiet against those dictatorships and systems. The persecution that we suffered there passes for phase one while we are now being treated to phase two of the persecution by the German authorities. And yet, they are surprised that we are not "quiet" as they expect us to be? Against such persecution? Something is definitely wrong. And it is not with refugees. Something is wrong with the politicians, the authorities and the oppressive system they perpetuate against innocent refugees. It is high time for the abolition of lagers and all discriminating racist laws against refugees and migrants because every human being deserve the right to human dignity and dream for a better world not characterized by trauma and insecurity. The culture of lager and the basis of all racist laws that offends the fundamental human rights and the unjust criminalization of refugees, arbitrary use of decree and state dimension of racial profiling has to be abolished. Refugees are confined like prisoners. We can not leave the local district without permission that are often refused at the discretion of the foreign officers. Also the separation of families and communities by deportation, lager isolation and movement restriction amongst other scandalous forms of persecutions and criminalization of refugees projects the inevitable need to protest colonial injustice executed by the German state. Much could be done to stop the institutional racism of lager to drastically reduce suicide and murder, trauma and psycho torture, institutional racism and sexual attacks on refugees. We call the immediate closure of all Lagers in Germany and demand the decentralization of refugees in standard accommodation! Resistance against the state policies of forced isolation. Abolition of unjust controls and "Residenzpflicht" and daily repression of refugees. An end to violation of the basic rights to education and medical attention. From Sachsen-Anhalt, there are numerous reports on the struggles of the Flüchtlingsinitiative Möhlau-Wittenberg to close down the isolated camp in Möhlau (Landkreis Wittenberg). The protest generated a strong public concern and solidarity of different groups of anti-racist movement beyond regional level that mounted pressure on the local administration to declare for a change. Although the authorities are trying to delay the process, some refugees families already moved to private apartments while others would be shared to other lagers. Refugees in Wittenberg are watching how they were been treated in the local government. In Thüringen, The VOICE Refugee Forum, the caravan and other supporting groups also achieved success after two years protest of refugees in Katzhütte isolation lager, most infamous for its extremely unhealthy living conditions. There are still quite a number of isolation lagers in Germany with similar conditions as in Katzhütte. Activists of The VOICE and solidarity groups are formulating strategies after the Katzhütte success to close lagers one after the other to see the end of all existing horrible isolation lagers. The Katzhütte solidarity protest action led to the success to close down the isolation lager in Gehlberg in 2009 even before the closure of Katzhütte in 2010, including the recent closure of Apolda - Stobraerstraße in Thüringen in 2010 by the protest of the former refugee activists from Katzhütte who are living the new refugee camp in Apolda. In Remscheid in North Rhine-Westphalia, refugees from a camp also embarked on a protest against isolation, deportation and extreme despotism of the authorities. They started to rise up after one of their friends in Bergfriederweg, the musician Mohammad Selah (Sillah) died in January 2007. The city administration of Remscheid refused to give him the needed medical care. The refugees were confronted with a police raid later in the same year 2007. The refugees did not accept the horrors that were posed on them. They held public actions and press conferences. They formulated their first open letter in Remscheid. Since then many things have changed in Remscheid, but still there is a lot to do. Bavaria refugees protested the unjust handling of refugees and the lager isolation. Refugees went on hunger strike and long lasting food boycotting in 2010. More than 400 refugees from more than 10 camps participated. The strike started in far remote camps in Niederbayern and generated impressive participation in Regensburg, Passau and Augsburg. The strike was an important impulse for the organization of refugees and their friends in Bavaria. The echo in the media was enormous, especially with the hunger strike that made the affected refugees visible as actors in the refugee political debate in Bavaria. At the same time with the CARAVAN festival 2010 held in Jena the refugees in Meinersen, Lower Saxony started with their protests. The refugees went to the streets to protest the isolation lager and the atrocities of the administration. There is an intensive fight which is bringing light to a very dark side of the authorities from that district. In March 2011, Shambhu Lama a refugee from Nepal committed suicide. The information leaking to the public show, that the employees of the foreigners office of Gifhorn did their best to destroy Shambhu Lama life. Joshua, Shambhu Lama’s one-year old son is still alive and grows up without knowing his father. Joshua’s mother, Nadine Tannenberg have accused the administration of being responsible for Lama’s death and she joined to the struggle for the future of those who are still alive and are not born. The Caravan Festival in Jena inspired the mobilisation for self organisation of refugees in Baden-Württemberg. Starting with the refugee initiative in Biberach, activist of the Voice visited more than 20 lagers in Baden-Württemberg, some refugees were already determined and self organised like Hardheim and Schwäbisch-Gmünd but the structure was dependent on the same system that implemented the repressive reforms rather than a proper political positioning that gives no room to compromise. The Stuttgart conference for refugees "Refugees have a Voice" of March 12, 2011 organised by The Voice Refugee Forum was part of this mobilisation that has seen more of communities building up in lagers like Mannheim, Konstanz, Witthoh etc. Our target now is to keep constant exchanges between refugees through regional meeting of delegates to present situation reports of their various lagers. Other success stories from our experience with the refugee activists range from supporting lager closures since 1995 till 2005 in Saalfeld, Kuhnhausen, Bischofroda in Wartburgkreis, Tambach- Dietharz, Jena Forst, Freienbessingen and Markersdorf in Thüringen, including Parchim in Mecklenburg-Vorpommern with the active support of the Caravan network and antiracist activists in Germany. Lets not forget The VOICE initiative to close the abandoned lager of refugees in the short time of protest during the antiracist border camp in Zittau in 2001 and the closure of the Posseck refugee lager in 2008 in Sachsen. Nevertheless, it is also important to note that. . . These protests and resistance also lead to the aggressive persecutions of the refugee activists by the authorities. On the other hand, it led the authorities to suspend bringing African refugees to Thüringen for seven years until the recent arrival of tens of Somalians in late 2010. We have succeeded in stopping the deportations of some activists who had become targets of the authorities through solidarity with other antiracist activists who fought against their deportation. We will need much of your support to stop the further persecution of refugees in Germany. We are uniting to attack and to confront the racist propaganda of Europeans to humanize their colonial logics of repressions, oppressions, discriminations, persecutions and the exclusions of the refugees and migrants in Europe. We call on all engaged with the refugee struggle for freedom and human dignity in Germany to unite in solidarity for together, we shall overcome.